If you missed the very first run of Secrets: A Night with Aia, Kitchie and Barbie, Vandals on the Wall and Gabi Na Naman Productions just announced a repeat performance of the sold-out concert. 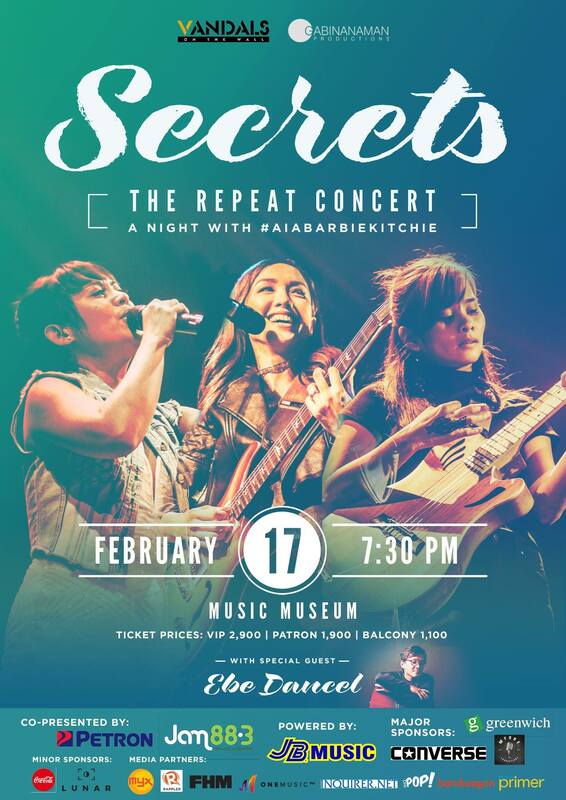 Aia de Leon, Kitchie Nadal and Barbie Almalbis are set to return to the Music Museum stage on February 17, 2016. Secrets: The Repeat will also feature singer-songwriter Ebe Dancel as a special guest. Limited tickets are now available online. For offline purchases, contact Leah of VOTW /Gabi Na Naman Productions at 0917-878-9803.